dodgy panaroma, but it shows the night market we had dinner in tonite. 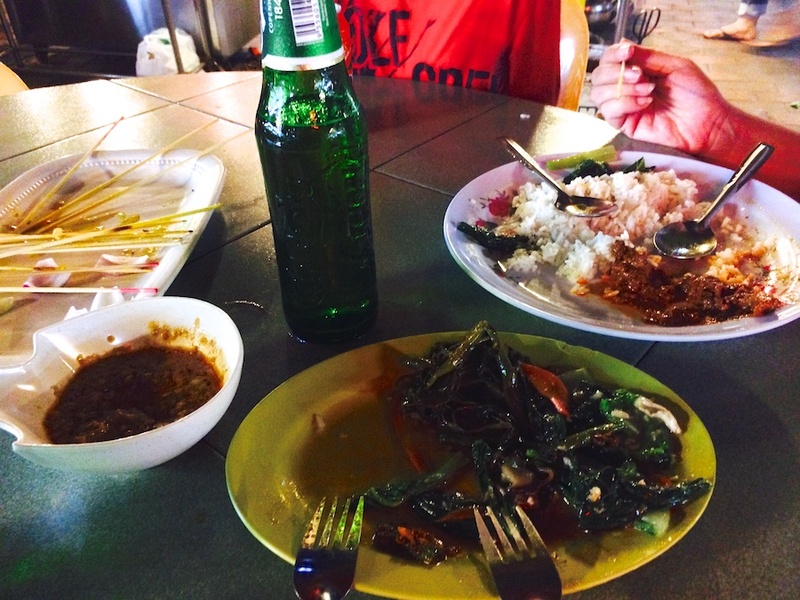 cant go wrong with a few plates of food, a heap of satays and a couple of cold beers! today happens to be my birthday and the start of our latest travel adventure, we left home last night, after a lovely ‘last supper’ with jeremy & leesi, they dropped us at the airport and we headed off to darwin. we had one of the worst flights i have ever had, really bad turbulence due to big thunderstorms in darwin. we ended up circling for an hour waiting for a gap in the storm cells to plonk the plane on the tarmac. we then had a couple hours waiting in darwin airport before we left for singapore, so i turned 21 again in australia, eventually we boarded our silk air flight to SNG and headed north. after flying through the early hours of the morning we arrived at changi airport at about 7.30am and cleared customs and immigration then stumbled around the three terminals showing kai the airport and filling in a bit of time before catching a bus across to the border, clearing out of singapore customs and immigration and then into malaysia. so by the time we were jumping in a taxi as we exited malaysian immigration, i was in the 3rd country for my birthday, and by this stage feeling a bit second hand! our good fortune was doubled when the hotel informed us the previous guests had already checked out and our 2 bedroom family suite was cleaned and available to check in! so we were able to settle in to our room at 9.30 in the morning which was a great relief after a long night of travel. we ventured out for brunch and i found a little local restaurant that cooked murtabak daging – one of my favourite morning dishes in malaysia. if you are not familiar its an Indian Muslim wrap. It’s a large, thin, roti stuffed with various meat fillings, along with eggs and onions and then fried on a hotplate. daging refers to the meat being beef. 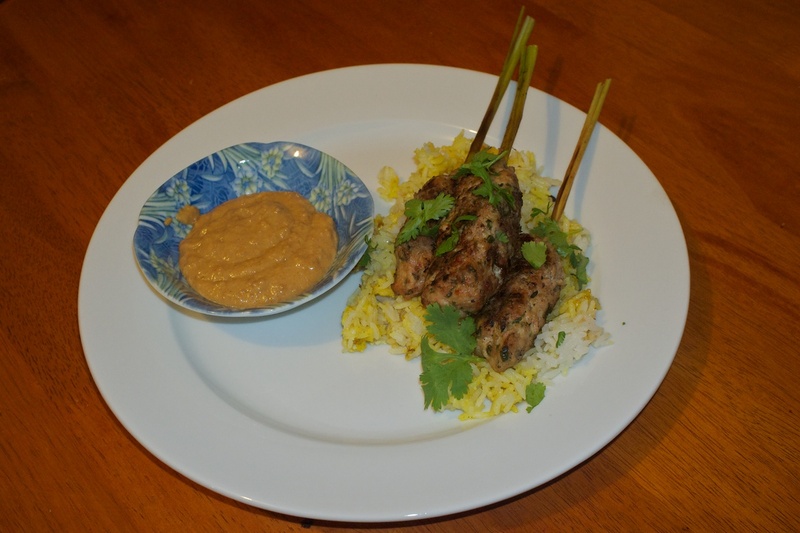 its served with dahl and a couple of different curry sauces, you tear the murtabak into pieces and dip them into the sauces. its simply the best way to start a day! we then returned to the hotel for a well deserved siesta, there are no photos of the brunch because we woofed it down before i thought of taking a pic! we did some more wandering around Johore Bahru in the afternoon and picked up a bit of shopping. its great to be somewhere where you simply dont see any other tourists and no one humbugs you on the street on in the shops. most tourists dont stop in JB, they stay in singapore and then go straight to malacca, KL or Penang. tonite we went to a little local food court round the corner and filled up on chicken satays, beef rendang, pork ribs and various vege dishes, all washed down with a couple of carlsberg beers! again i forgot to take photos until the meal was nearly finished, but here is a snap of the mainly empty plates! time for an early night now, i feel as if my birthday has gone on for about 3 days! we are off to legoland tomorrow which has kai beside himself with excitement, but i know it will be another big day so we need to recharge the batteries.